At the close of the 58th Kerala State Schools Athletics Championship, only one girl had tears rolling down her eyes and what was surprising was that the girl in question was Jisna Mathew of Usha School of Athletics, who was one of the topnotch performers in the meet. The girl, who will turn 16 next month, had ended up on top of the podium in 100m, 200m and 400m races fair and square and was also named the individual champion in the junior girls’ category, much to the envy of fellow athletes. So, we probed her coach P T Usha on why the athlete was feeling down despite her commendable feat and the former sprint queen said that her disciple was too much of a perfectionist for her age. “We had set a target of 24.7 secs to complete the 200m which she did at 25.3 secs. Also, maybe because the Kozhikode relay team could only finish second which wasn’t her fault,” Usha ponders the reasons, but quickly adds that with the facilities provided, she was more than pleased with Jisna’s triple gold. “She can only improve from head to toe from now on,” Usha is confident of Jisna’s credentials and feels that she can overshadow the feats of Tintu Luka — whose 400m state record she felled to win the 400m gold at Thiruvananthapuram. “Both of them are very hard working, but Jisna doesn’t look to be as injury-prone as Tintu. Both have difficulty in grasping things, but Jisna’s acceleration in the first 50-80 metres is much superior,” Usha compares her students. “Jisna might be a little short, but has the lanky legs needed to more than make up for it,” says Usha who sees Jisna as a natural 800m runner for the future. “We are slowly building her up for what we feel might be the best for her,” she says. At Usha School where she joined four years ago, Jisna is yet to undergo any weight training or hill workouts to improve on her power. “We are preserving her and for the next season, we will give her light workouts which will make her even better,” Usha says. Jisna was also the best under-16 athlete at the recently concluded National Junior Athletics in Vijayawada where she won the 200m and 400m titles and is now looking forward to the national schools meet. “I want to do better at the national meet and win laurels for the state,” she said during the state meet. 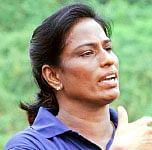 Usha, meanwhile, hopes that her pupil will be able to rub shoulders with senior athletes at the 35th National Games slated to be held in Kerala from January 31, 2015. “I am confident that her performance matches the levels of under-20 athletes. I would really like to see where she stands in 400m at the Games if the regulations allow a 16-year-old to compete in the event,” Usha says, an endorsement to her belief in Jisna.